October 2, 2018: According to recent reports Datusn India, the Indian subsidiary of Japanese car maker Nissan Motors has started receiving the bookings of facelift Go hatchback with the token amount of Rs. 11,000. The facelift Go is reported to make its debut in the Indian car market on October 9, 2018 and is reported to be equipped with bunch of new features, including standard safety features, with existing engine configuration of 1.2 litre petrol engine. Along with the regular colors, the new Go hatchback will be offered in new Amber Orange color option. June 20, 2018: It is reported that the Datsun India is going to launch the facelift version Go hatchback in the Indian car market sometime during the month of September this year. The hatchback will receive cosmetic updates both on the exterior and interior front, making it compatible for the existing conditions of the India. Mechanically it will be offered with the existing 1.2 litre petrol engine. August 8, 2016: Datsun India has launched the Style Edition of Go hatchback in Indian car market with starting price of Rs. 4.06 lakh (ex-showroom price, New Delhi). Continuing the existing engine configuration of 1.2 litre mated with five speed manual gearbox, the Style Edition of Go will be sold only from August 2016 to October 2016. Apart from existing white and ruby color it will be also offered in Blue color and will be equipped with some contemporary features. September 11, 2014: Datsun, the subsidiary of Japanese car maker Nissan which made its entry in Indian car market couple of months back by launching a hatchback Go has announced the benefits of Rs. 38,000 on purchase of Go till October 31, 2014. The benefits of Rs. 38,0 00 includes exchange benefit of Rs. 20,000 followed insurance of Rs. 4,000, cash discount of Rs. 10,000 and free extended warranty of Rs. 4,000 offered on first three D, D1 and A variants of hatchback. June 13, 2014: It is reported that Japanese car and subsidiary of Nissan Motors, Datsun is going to launch its highly successful and recently launched entry level hatchback Go in South African car market. The hatchback is expected to be launched there by the end of this year with expected price of R 100, 000. April 3, 2014: Datsun Go the recently launched hatchback by Nissan’s subsidiary Datsun is receiving an encouraging response from customers throughout the country. The car was unveiled during the Indian Auto Expo 2014 and launched on March 19, 2014. According to sales reports revealed by company it has sold out 2072 units of hatchback within the span of ten days after its launch. The car is empowered with 1.2 litre petrol engine developing the power of 68bhp and torque of 104 Nm. March 20, 2014: Keeping the requirement of women car drivers in concern Datsun has offered special edition named as Women Edition in Indian car market with various remarkable features which are not offered in the regular D, D1, A and T variants. The major features offered in Women Edition include reverse parking sensor along with a camera, parcel tray, rear and side curtain, cushion seat, mood light followed by interesting body decals which give this edition a unique look. March 19, 2014: Launched in three variants D,A,T referring lightening fast in Japanese, Datsun the subsidiary of Japanese auto giant Nissan has launched in entry level car Datsun Go hatchback in Indian car market with starting price of Rs. 3.12 lakh for base variant D, whereas mid-sized variant A with price tag of Rs. 3.46 lakh and top end variant T priced Rs. 3.60 lakh (ex-showroom price respectively of all variants in New Delhi). Datsun Go is bestowed with 3 cylinder, 1200 cc engine churning the power of 68 PS and torque of 104 NM which is similar to Nissan’s Micra hatchback. Datsun, the subsidiary of Japanese auto giant Nissan Motors is back into global market after a long break. This time it is making its entrance in market through MPV and hatchback vehicle which are soon going to make their presence in Indian car market. However the first vehicle to keep its step in market is Datsun – Go which is a hatchback car and which has succeeded in grabbing attention of buyers quite earlier before its actual launch. After this company is speculating to bring Datsun-Go + in market which will be a MPV. The reason behind the launch of Datsun Go is increasing market of hatchback segment in Indian car market, especially after the launch of Hyundai Grand i10 in Indian car market few months back. It would be interested to know that with an objective of placing tough competition against Grand i10 company has offered with starting price of Rs. 3.12 lakh (ex-showroom price in New Delhi). Developed especially for the first time buyers the car with this impressive mileage figures and blessed with various luxurious features is not less than a boon. Datsun Go D This is the base variant of Datsun Go hatchback which is equipped with three cylinder, 12-valve based 1.2-litre petrol engine, with displacement capacity of 1198 cc and develop the power of 67 bhp at 5000 rpm and torque of 104 Nm at 4000 rpm. The major features offered in this variant includes air conditioner, child safety locks and seat belt warning. Datsun Go D 1 Apart from carrying the standard features as offered in base variant this variant impinges additional features like front door map pocket, passenger side ORVMs and front door bottle holder. Datsun Go A This variant adorns body colored bumpers, jacquard seat fabric followed by necessary features available in above two variants. Datsun Go T This top end variant is equipped extra features like front power windows, wheel covers, front speakers and central locking. 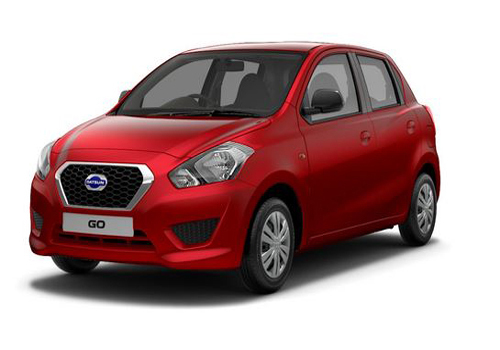 The new hatchback Datsun Go carries the same 1.2 litre petrol engine which is offered in Nissan Micra, the hatchback from its parent company Nissan. The engine has displacement capacity of 1198cc, develops the power of 67bhp at 5,000 rpm and torque of 104 Nm at 4000 rpm. The engine is coated with five speed manual gearbox facilitating the customers to shift gear during all driving conditions delivering fuel efficient performance of 18.05 kmpl in urban areas and 20.63 kmpl on highway. According to sources of company it has developed this hatchback keeping in concern the requirements of generation next buyers. It is reported that it can accelerate the top speed up to 160 kmph and pick up the speed of 100 kmph within the span of 15 – 20 seconds. As mentioned above company has developed this hatchback according to expectations of generation next buyers it has worked hard on reaching their expectations. The first thing which will be appreciated by buyers is space because it is blessed with spacious interiors which are developed with gracious and sober look. The interiors trims have been developed with high quality plastic. The gearshift has been developed in a small console placed below the dashboard and is covered with leather upholstery. The central console integrates music system, which is compatible with USB socket and AUX in support, followed by air conditioner vents garnished with chrome. The seats have been developed with high quality fabric upholstery. The front fascia of this hatchback has received large radiator grille garnished with chrome followed by logo of DATSUN placed in centre of grille. The headlight cluster has been given a dynamic look supported with side indicators. The sporty bumper along with air dam and air ducts are enough to give this hatchback a sportier look. Moving towards the side profile the body colored door handles and black colored exterior rear view mirror gives an attractive look to car. Moving towards the rear side the body colored bumpers with eye catching tail lights have capacity to grab attention of every person walking on road. With this boot door carries the DATSUN logo in centre further endorses it to be the best car in its segment. The Datsun Go is blessed with all necessary safety features which are available in other cars existing in segment of same price tag. The major safety features mounted in this hatchback include air bags for front passengers, central door locking system, engine immobilizer, driver side power window, child safety lock on rear doors, side and front impact beams, powerful halogen headlamps, tilt power steering, seat belts and many more. The power steering in this vehicle which will make easier for driver to turn his vehicle easily in desired direction. It is expected that front wheels of Go are equipped with powerful ventilated disc brakes, whereas the rear wheels are bestowed with drum brakes. Apart from this the front wheels are equipped with McPherson Strut type suspension system whereas the rear wheels receive torsion beam suspension system. One thing which may disappoint buyers is absence of ABS+EBD. Although company has integrated all necessary accesories in this hatchback including high defined audio system followed by roof antenna for listening ongoing radio songs and news. Along with this company is also offering integration of various accessories at an affordable price being offered through its dealers. The different accessories offered by company include sporty rear spoiler, seat covers, mud flaps, carpets, graphics for side profiles etc. It can be said that with affordable price tag and fuel efficient performance Datsun Go will succeed in making its strong place in hearts of customers who prefer to buy qualitative products at an affordable price range.